Radiation cannot be seen, smelt or felt but in significant doses can kill. Understanding radiation and its risks and benefits can help individuals and society to make informed decisions about the use of radiation and the actions required to protect from possible harm. 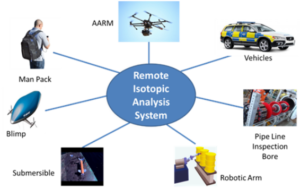 ImiTec’s unique Remote Isotopic Analysis System (RIAS) is different from current radiation detection systems in that in near real time it locates, measures and maps radioactivity and the isotopes present thus significantly speeding and improving the efficiency of radiation detection and decision making. Sensors to collect data (Kromek lightweight CsI or CZT gamma spectrometer and positioning devices e.g. GPS, LIADAR or IMU). Software to interpret data and produce maps showing the location and intensity of the radiation and the radionuclide type. 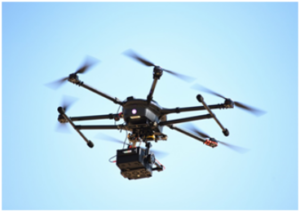 RIAS can be carried by personnel and can be mounted on a number of different platforms including unmanned aerial vehicles, road vehicles, submersibles, non-rigid airships, pipeline inspection rigs and robotic systems. RIAS can be used to detect radiation in the nuclear industry, defence, homeland security, mining, and exploration. Rapid emergency response monitoring of radiation events, providing real-time data on spread, source and intensity. Routine monitoring of nuclear installations throughout the life cycle from new build to decommissioning. Monitoring of combat zones for spent depleted uranium munitions. Combination of radiation mapping with optional aerial imaging and observation. 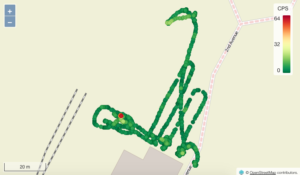 Radiation mapping on and off road! Innovate_UK Project INTEGRAL successfully completed! Copyright © 2019 ImiTec Ltd. All rights reserved.